Christina Caffrey, at 22 months the youngest victim of the Rising, was shot in her mother's arms at the door of her house in Church Street. She was buried in an unmarked plot in Glasnevin that is now traversed by a walkway to the republican monument. It is sadly symbolic of the theme of this wonderfully compassionate book that her memory should have been trampled on for so many years and by none more than the throngs arriving to celebrate the memory of those who fought and died for a promise to cherish all the children of the nation equally. Chrissie Caffrey was not alone in being forgotten. Joe Duffy, in what is a worthy act of retrieval and restoration, has identified 40 children under the age of 16 who died in the fighting in Easter Week - all of whom have been written out of history, or never included in the narrative, whether of glorious sacrifice or the triumph of arms. The great achievement of this handsomely produced and lavishly illustrated volume is to recall them to life by describing, individually, the circumstances of their deaths; celebrating each as a person and as part of a family, as a member of a tightly-knit and crowded community; by the time and location of death; by their treatment in hospital; by the ceremony or lack of it of burial; by the long-term effect on families as they struggle to come to terms with the loss of a cherished child, often a breadwinner. All this has been achieved by combing census returns, from hospital and cemetery records; from contemporary newspaper reports and death notices; from official files and the Bureau of Military History; from survivors' stories and histories of the period; and from interviews with relatives. If he has not managed to recall them to life, he has given each back their identity and a place in history as evidence of the price that has to be paid by those least capable of doing so for the blind idealism and belligerence of others. Nine children were killed in the first nine hours of the Rising - the grim flip-side of 'Off to Dublin in the green'. For them there was no ballad, no funeral oration, no memorial in stone or bronze, no demands for retrospective inquiries, for closure or compensation. In a book which deserves to be ranked with the much-acclaimed 'Lost Lives', which chronicles the fatal casualties of the northern Troubles (including, incidentally, 57 children under 12 and not counting deaths in utero). Joe Duffy has not only given the children their due, but offers a means for modern Ireland to make some sort of reparation for the way official Ireland and history has treated them. This is an important contribution to the current debate on commemoration as the centenary approaches. It adds depth, colour and perspective to the picture that is being drawn of the Rising by showing the shades of support and opposition among ordinary people, the complexity of the social situation out of which the participants emerged and the conflict of loyalties and allegiances. The mother of Seán Foster, the first child to die, had a husband killed in France a year earlier and a brother out with the Volunteers. Duffy also succeeds in putting the children (and the Rising) in the context of social conditions in Dublin at the time: overcrowded and often dangerous tenements; enormously high densities; pervasive poverty and unemployment; high mortality from chronic diseases; low life-expectancy; the highest rates in Europe of maternal and infant mortality; only four out of 10 children surviving to the age of 10, and high dependency on remittances and pensions. The children who died included both rich and poor, Catholic and Protestant, 10 of them had close relatives serving in France, some were engaged in looting, some innocently caught in crossfire, some shot indiscriminately by the British Army and some when civilians opposed the rebels. Emma Warbrook was shot in the face while jeering at the garrison in Jacobs - Christopher Hickey was bayoneted through the heart by brutal soldiery in a notorious massacre in North King Street. Most, however, in the easy cliché, were in the wrong place at the wrong time. Denizens of the streets, by nature messengers and runners, they were most at risk (in what Ruairí Ó Brádaigh, in a later conflict, was to dismiss as "one of the hazards of urban guerilla war"). There was Neville Sweny, shot giving a drink to a wounded soldier on Mount Street Bridge - (wasn't that Jean McConville's 'crime' too?) - or George Sainsbury, aged nine, who put his head out the window in Rialto, or Christy Whelan, shot while in bed in Mary's Abbey. Then, too, there was William Fryday, who had lied about his age to join the Canadian Army, home on leave from England to visit his mother, shot while walking in uniform outside Trinity College. If Seán Foster, two years old, killed by a rebel bullet in his pram in Church Street, "shot through the head at the level of the ear", was the first child to die, almost the last was Bridget McKane, shot by an accidental discharge as the leaders of the Rising, retreating from the GPO, took refuge in her house off Moore Street. Only Joe Duffy would notice that Bridget McKane's scrap-book contained a cutting describing the life-threatening injuries of a young Luke Kelly, shot on Bachelor's Walk two years earlier, who survived to father the famous ballad singer, or that Neville Sweny's father kept the chemist's shop patronized in 'Ulysses' by Leopold Bloom. The families had to struggle for compensation from unsympathetic bureaucracies, both British and, later, Irish. Sarah Caffrey, mother of the youngest child shot, had her award of £25 slashed to £5, and an award of £10 for funeral expenses disallowed because an industrious detective reported that the coffin had been supplied free by the North Dublin Union and the bereaved father and a friend had carried it the whole way to Glasnevin at no extra cost. Seán Healy, at 15 a member of Na Fianna, was the youngest republican combatant to die. Years afterwards, his mother provided what is perhaps the best epitaph for the children in this book (and for all who die in conflict). She said: "It's easy to die for Ireland. What Ireland needs is for people to live for Ireland." The real tragedy is that these children were arbitrarily prevented from doing so. This is an important and timely book, which should be widely read in the months ahead. The Government, which is gifting a Tricolour and a copy of the Proclamation to every school in the country could do worse than include a copy of this volume in the package. 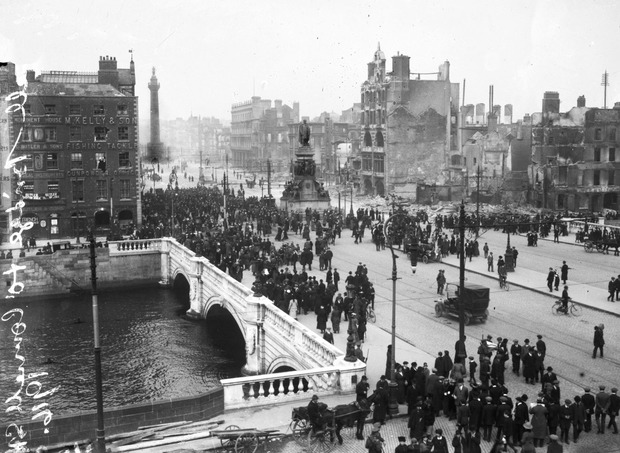 Whose fault were the Civilian Casualties in 1916? John Dorney In the aftermath of the Easter Rising, Dublin Corporation pasted notices up on the city’s walls advising citizens to inform the authorities immediately on coming across dead bodies.